Chinese elm (Ulmus parvifolia) is an evergreen tree that works well in Florida landscaping. They can adapt to many conditions such as soil acidity and varying light levels. Their interesting bark and fast growth make them a good choice in landscape use. With any plant, pests are bound to happen. Regularly checking for common pests will ensure the plant’s health. This publication has listed some threats which can be a threat to Chinese elm. 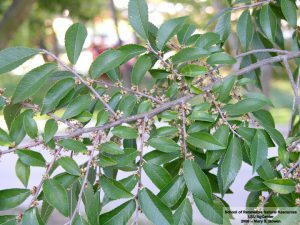 Check out “Key Plant, Key Pests: Chinese Elm (Ulmus parvifolia)” by MREC researcher Richard Beeson Jr. and science communication specialist Caroline Roper Warwick for more information on keeping your landscape looking its best. Here is the link to download the document. Jacqueline is an undergrad student at UF. She is pursuing a degree in Forest Resources and Conservation as well as in English, with hopes of going into environmental law.